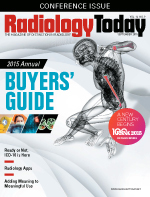 Ask half a dozen radiologists about mobile radiology apps and you can expect about six answers. Many PACS offer a mobile viewer, which tends to serve as an emergency tool for most of the radiologists who use it. Who would want to view images on a smaller screen with fewer tools than their workstation? Enough radiologists have workstations set up at home to handle many of those cases as well. The appeal of many reference and education apps also is a matter of personal preference. It makes sense that less of radiology is migrating to handheld devices than is the case in many other fields. That said, here's a list of radiology apps for the Apple and Android platforms. We'd also be interested in which radiology apps—as well as any others—you find useful so we can share them with readers. Please e-mail us at rteditor@gvpub.com or let us know on Twitter (@RadiologyToday) or Facebook (Facebook.com/RadiologyToday). OsiriX HD is a widely known full DICOM image viewer, which allows for downloading and manipulating a series of images from all modalities directly onto an iOS device. The app works with any DICOM-compatible software, including PACS, medical workstations, and acquisition modalities. The app provides interactive image manipulation tools such as zoom, pan, cine, and contrast adjustment images through a multipoint touch screen interface. Mobile MIM offers real-time viewing, registration, fusion, and/or display for diagnosis of medical images from the following modalities: SPECT, PET, CT, MRI, X-ray, and ultrasound. However, the app is not for use with mammography. Mobile MIM can be used to review images, contours, dose-volume histogram, and isodose curves from radiation treatment plans, and can also be used to approve those plans. Data can be securely transferred using MIMcloud or MIM 5.1+ workstation software. The mobile syngo.via WebViewer application provides mobile device access to Siemens' syngo image system data using standard viewing tools. Centricity Radiology Mobile Access provides secure Internet access to images and reports from Centricity PACS, Centricity Enterprise Archive, and Advantage Workstation Server. The app supports a broad range of modalities with 2D, 3D, and maximum intensity projection/multiplanar reconstruction (MIP/MPR) capabilities. The app is primarily for image review and analysis. Diagnostic use applies for CT and MR images only when a diagnostic PACS workstation is not available. Fujifilm Synapse Mobility provides radiologists and physicians with mobile access to images and information stored within Fujifilm's Synapse product suite. Images can be manipulated using the 2D, 3D, and MIP/MPR feature sets. When working in 2D, images in a series are organized into stacks instead of volumes. The app allows encrypted URL launching for EMR systems and also report URL launching directly from studies. Mobile Rad enables users to securely view patient reports and images, allowing them to make comparisons to prior studies. The app supports all imaging modalities and maintains the integration of full-screen viewing. The app also maintains a HIPAA-compliant and secure login system to a NovaPACS facility. The app is not intended for diagnostic purposes. iClarity Lite is a medical image viewing app that enables the receiving and viewing of images stored on Clarity PACS that has the separate iClarity Server module installed. The connection is secure and password-enabled. Features include connectivity to multiple Clarity PACS, search and sort worklist capabilities, and rapid zoom, pan, window, and level. Users can scroll images in multislice series and "shake" to reset images. INFINITT Mobile Viewer HD is intended for review purposes only. This app is not approved for diagnostic use. The app enables access to a central DICOM server that runs on mobile devices. The app supports functions such as windowing, zooming, panning, Hounsfield unit scaling, measurements, cine play, e-mail, and report viewing. The app requires INFINITT PACS and INFINITT Mobile PACS server. Radiology Toolbox Pro was designed by practicing radiologists to help radiologists, radiology technologists, other health care practitioners, and students by pulling together facts relevant to the practice of radiology. The app's current version includes information such as criteria for management of adnexal and renal cysts, thyroid issues, and pulmonary nodules; adrenal adenoma and glomerular filtration rate calculations; and charts of Amniotic Fluid Index, pediatric spleen, and kidney size. PowerScribe 360/Mobile Radiologist allows imaging professionals to use smartphones or tablets to securely manage work lists, edit and sign reports, and use speech to create new reports or addenda in PowerScribe 360/Reporting. Users can use their voices to search content and can research medical terminology, find similar cases, access the latest medical research, and read top imaging news stories. Nuance PowerShare is a secure cloud-computing platform for medical image storing and sharing, providing instant mobile device access to medical images and reports stored on the Nuance PowerShare Network. The app also allows users to take clinical images from their camera or device storage and upload them securely to their account, to later share with physicians or medical facilities. Once an image is selected, it can be manipulated to window/level, zoom, and stack through all available frames. Use requires a secure login and pin. The lifeIMAGE network allows patients, physicians, and hospitals to electronically share imaging exams from any hospital or clinic. Users can review studies that have been shared with them or upload and share new images captured with the camera on their iOS device. Exams can be tagged to make it easier to search for exams and access studies. This app is only available for physicians who are affiliated with, or who refer patients to, hospitals and clinics using lifeIMAGE's LILA server or a lifeIMAGE cloud service. AbbaDox Rad allows radiologists and imaging centers to share diagnostic images with referring physicians. Users can simultaneously view images from multiple series and studies. Also, users can use referring lines to help synchronize scrolling between images, zoom, pan, magnify, and rotate images, and mark images with annotations or added callouts. MIRC Viewer enables users to search for and view Medical Imaging Resource Center (MIRC) cases using mobile devices. The app works with any specified MIRC storage service, which is the basis of RSNA's Teaching File System. The app supports iCloud, but also can store and view cases locally. Users can also sync a collection of cases among devices. The Radiology app provides immediate access to full-text articles published in the Radiology journal for RSNA members and subscribers with personal and institutional subscriptions. Nonsubscribers can access all abstracts for free. The app enables users to view both current and past full-text articles with hi-res images, watch and listen to related video and audio sound bites, bookmark articles, and conduct searches by author, title, and article content. Users can also take SA-CME tests. Thoracic Radiology Differential Diagnosis Lists provides a way to review differential diagnoses for chest CT findings and discover common CT imaging presentations associated with certain diseases. The app maintains images covering differential diagnoses that involve the lung, pleura, heart, mediastinum, lymphatics, and large airways. Physicians can utilize the search function or browse through approximately 80 differential diagnosis lists by alphabetical order or by organ system. Monster Anatomy Lite — Knee, the free version of Monster Anatomy — Lower Limb, is for use by health care professionals and students as a reference tool. The app, developed in the medical imaging department of the University Hospital Center of Nancy, France, contains 82 contiguous knee MR slices in three anatomical planes. The functionality offers intuitive navigation with multiple shortcuts. In addition, 3D image volume allows for precise location of slice position. Brain MRI Atlas is an interactive study and reference app that allows users to search a database of labeled brain structures, highlighting serial sequential axial T2 Flair images. Structure labels are color coded and organized by category. App navigational tools include a slide bar for easy searching and toggle controls that disappear with a single touch. Essentials of Pediatric Radiology Companion presents an overview of various levels of topics faced specifically by pediatric radiologists. Cases include a brief patient history, radiographic images taken with multiple modalities, and a series of multiple choice questions pertaining to each case; questions model the American Board of Radiology and certificate of added qualification exams. Feedback users receive includes whether or not their answer was correct, further detail related to their answer, and the correct answer. A discussion session occurs at the end of each case. IMAIOS e-Cases gives users the ability to download and share interactive radiology cases and virtual medical imaging workshops. Cases, updated daily, come from multiple specialties and involve a variety of modalities. Users can view radiologists' case annotations and add their own comments. Database access requires an IMAIOS.com account. Radiology 2.0 is meant to be used as an instructional tool that presents a series of cases, enabling users to simulate reading CT scans at a PACS workstation. The app includes labeled images after each case that highlight pathologies and relevant findings. Volume 1, One Night in the ED, contains cases commonly found in an ED setting—acute thoracic, abdominal, and pelvic pathologies. Epocrates allows health care professionals to review drug prescribing and safety information for brand, generic, and over-the-counter drugs. The app also offers access to updated medical news and research information. Secure consultations are enabled via HIPAA-compliant text messaging. Additional content—disease information, clinical practice guidelines, alternative medications, lab guides, and coding—is available with an upgrade to Epocrates Plus ($174.99 subscription price). Epocrates CME provides programs that can help medical professionals fulfill continuing medical education (CME) requirements, with interactive activities that cover numerous specialty topics. These activities are accredited by the American Medical Association, Accreditation Council for Pharmacy Education, and American Nurses Credentialing Center, and supported by an advanced personal CME toolset. Activities include built-in feedback, integrated decision-making opportunities, peer-to-peer interactions, and expert discussions. The app can also help users track credits and scores, compare scores with other learners, and set and track goals. Doximity—Physician Network provides physicians with a network of medical professionals for HIPAA-secure communication. Users can search the network for coauthors, medical school and training colleagues, primary care physicians, and specialists. The app also aggregates customized medical news and journal articles, and users can earn category 1 CME for reading articles selected from the app. The app also offers career management options. Radiology Assistant is a medical imaging reference and education app that aggregates timely articles, available as free downloads. The app supports full-text searching across all content. The app also incorporates a full-screen display feature that shows hi-res content at full retina resolution.